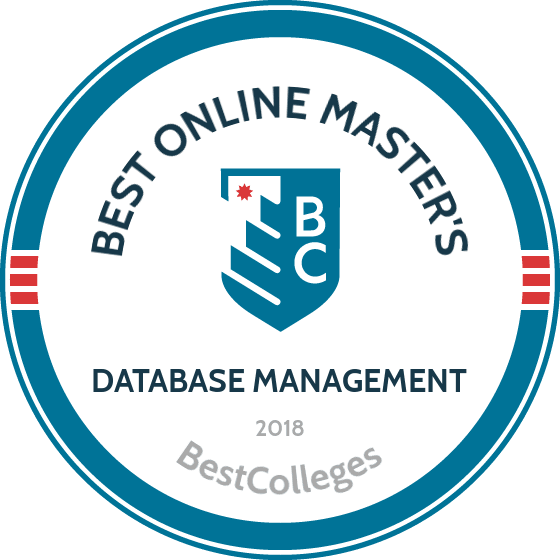 What Are The Best Online Master's in Database Management Programs? What Else Can I Expect From an Online Master's in Database Management Program? If you're an ambitious learner with your sights set on upper-level and managerial positions in data and information management, a master's in database management could be the best way to position yourself for long-term career success. As companies seek to effectively manage and secure ever-increasing amounts of data in complex data repositories, demand for well educated professionals in the field continues to grow. The U.S. Bureau of Labor Statistics projects faster than average growth of 11% for database-related jobs through 2024. Read on for more about master's in database management programs and career opportunities for graduates. Regis is a private Jesuit university that offers a 36-credit MS in data science. The program boasts a curriculum with courses covering a variety of topics, such as machine learning, exploratory data analysis, and optimal decisionmaking. Students must also complete two practicum experiences in data science. Graduates are prepared for careers as data analysts, engineers, or architects. Students can choose to enroll in either asynchronous or synchronous courses. Asynchronous courses allow students to complete coursework at their own pace, making it an ideal choice for distance learners who work full time. All online students pay the same tuition rate, regardless of residency. Applicants must have a bachelor's degree that was earned within the past two years, and must have at least three years of experience in the field to be considered. Regis is accredited by the Higher Learning Commission. UD has expanded its online presence in recent years through the school's College of Professional and Continuing Studies. The school offers a variety of distance learning programs, including an online master's in database management program with a concentration in database design and administration. The curriculum includes courses covering topics such as data warehousing design and web-enabled information systems, as well as a capstone project or seminar. Courses are delivered asynchronously online, allowing students to complete coursework at their own pace. Graduates are prepared to pursue careers as database managers, database administrators, or systems analysts. Applicants must have a bachelor's degree with a minimum GPA of 2.5 to be considered. However, they do not need to submit GRE or GMAT scores. Transfer students can apply credits earned at another accredited institution towards their degree, as long as it was earned with a minimum GPA of 3.0. DePaul is a private Catholic university located in Chicago. The school offers a 52-credit MS in information systems degree with a database administration concentration. This program includes coursework that combines a broad foundation in information technology with more specific studies in enterprise data management and enterprise cloud computing. Most coursework is delivered asynchronously online, although most students in this master's in database management program choose to blend online courses with on-campus coursework. Asynchronous courses allow students to complete coursework at their own pace, making it ideal for adult learners who work full time. All online students pay the same tuition rate, regardless of residency. Applicants must have a bachelor's degree with a minimum GPA of 2.5 to be considered. However, they do not need to submit any standardized test scores, letters of recommendation, or have prior work experience. Based out of La Jolla, California, National is a private college that offers over 100 online programs, including an online MS in computer science program that includes an 18-quarter unit specialization in database engineering. The curriculum includes database-related coursework on topics like advanced database programming, database management systems, and database installation and configuration. Students must also complete two project courses, which are three-month projects in which students solve “a real problem for a real client against a time deadline” while working in a team with other students. Courses are delivered asynchronously online, allowing students to complete coursework at their own pace. Graduates are prepared to pursue careers as database administrators and engineers. Applicants to this online master's in database management program must have earned a bachelor's degree in a relevant field to be considered. However, students with a different degree may pass a course challenge exam to earn admission. UWF is a regional university with a nationwide online presence. The school offers a variety of distance learning programs, including an MS in computer science degree with a specialization in database systems. The 30-credit curriculum includes courses on several topics, such as SQL, big data, and database programming. All students must also complete a capstone that involves building software for a database. Most courses are delivered asynchronously online, although there are some proctored learning requirements. UWF evaluates each application holistically, meaning there is no minimum undergraduate GPA requirement. However, competitive applicants usually have scored at least a 370 on the MAT or a 145 on the quantitative GRE section and a 150 on the verbal section. Graduates with a master's in database management from UWF are prepared to pursue database engineer/administrator roles with local and regional companies and other governmental agencies. Program details for the master's in database management vary by school and program; some programs emphasize design or application development, while others emphasize high profile areas such as big data analytics. All students study essential elements of the field, such as database architecture, data mining, data warehousing, and data analytics. Although each school has its own coursework requirements, you can expect fundamental classes in database design, implementation, and administration. Read on for sample courses in a typical online master's in database management program. Database administration: This course introduces the primary responsibilities of a database administrator, with a focus on the Oracle and SQL server platforms. Core study areas include installation, configuration, implementation of account privileges, data modeling, disaster recovery, performance analysis, best practices in database security, and monitoring and maintenance of database platforms. Database design: This course provides an introduction to design elements and principles in database systems. Topics covered include requirements analysis, entity-relationship modeling and mapping, conceptual design, interface design, basic normalization, design implementation, and LAN, internet, and distribution system design. Students also learn basic maintenance and testing of relational database systems. Data mining: In this course, students explore the use of automated analytical search tools to detect useful patterns in large data sets. Core subject matter includes data mining concepts and techniques, data cleaning and pre-processing, association rules, classification algorithms, attribute relevance analysis, generating concept hierarchies, cluster analysis, and a survey of data mining software. Data warehousing: This course covers practical methods for linking data sets to create complex searchable databases. Core study areas include design and construction of data warehouses, theoretical and planning issues, data quality and metadata, development methods, data warehouse architecture, and physical design, construction, implementation, and administration. Database management systems: In this course, students study the principles and internal workings of database management systems. Topics covered include file structure, concurrency control, hashing, index structures, transaction processing, query optimization, theories of physical storage management, database backup and recovery methods, and the four transaction properties of atomicity, consistency, isolation, and durability. How Long Does it Take to get an Online Master's in Database Management? Most master's in database management programs comprise 40-50 credits on average, including a capstone, and can be completed in about two years of full-time study. Part-time students typically take three to four years to graduate. If you have recent eligible graduate transfer credits -- at some schools, this includes credits obtained through a database-related certificate program -- you may be able to shorten your degree completion time. Some programs may waive introductory courses for students who complete graduate assessment exams in the subject area, or demonstrate relevant and verifiable professional experience. Students pursuing database management as a second master's degree generally must complete a minimum number of credits beyond their first master's. Graduate programs in database management are typically individually paced, rather than structured on a cohort learning model in which students progress through all the coursework together and graduate as a group. It is important to verify that any school you're considering for your online master's in database management is properly accredited by a reliable, recognized accrediting agency. Accreditation is an official peer review process to evaluate schools' adherence to rigorous quality standards. Accreditation agencies are classified into three categories: regional, national, and field-specific. Regional accreditation is the most popular designation, and is widely respected by employers and educational institutions. National accreditation is less standardized; it is usually granted to schools providing vocational or technical training. For distance education programs, the Distance Education Accrediting Commission also provides a review process to ensure compliance with stringent national standards of academic quality. While there are no field-specific accrediting agencies for database management programs, you can investigate the quality of the programs you're considering by checking graduation and job placement rates. Two organizations are responsible for ensuring uniform standards of accreditation: the U.S. Department of Education (ED), which recognizes accreditation agencies; and the Council for Higher Education Accreditation (CHEA), which provides its stamp of approval for agencies in the national accreditation category. Since transfer credits are generally accepted only from properly accredited schools, and federal financial aid is only available to eligible students enrolled in schools accredited by a federally recognized agency, it is to your advantage to verify the accreditation status of schools that interest you. You can do this by visiting the ED and CHEA websites, where you will find a comprehensive list of accredited programs and schools. Many database administrators start their careers with a bachelor's degree in management information systems. Candidates who supplement their undergraduate degree with master's in database management can position themselves for advantages in job placement, advancement opportunities, and salary outlook, particularly in companies with large databases. A recent report by the Georgetown Center on Education and the Workforce indicated that a master's degree results in increased lifetime earnings for a cluster of related occupations. For database administrators with bachelor's degrees, the report found that lifetime earnings are on a par with related occupations, all of which show increased earnings for graduates of master's programs. Annual earnings for master's degree-holders in database management vary depending on location, employer, market conditions, and level of experience. With overall median salaries ranging from $60,677 to $92,709 according to Payscale, salaries for database administrators tend to be higher for those with increased professional experience. Oracle database administrators enjoy the highest salaries at all stages of their careers. In the table below you will find Payscale data on median salary expectations for early, middle, and late career stages for database administrators, systems analysts, information technology managers, and related careers in database management. Database administrators typically begin their careers as data analysts or database developers. With experience, some specialize in data warehousing, data security, big data analytics, medical informatics, or applications such as Oracle. Graduates of master's programs often pursue opportunities to advance into network administration, consulting, or computer and information systems management; due to increased use of third-party database administration, some work remotely. Below you will find descriptions of five possible careers for graduates of master's programs in database management. Database administrators protect and ensure the integrity, security, and performance of databases. They ensure that captured data is readily available, reliable, and free of errors. They backup and restore data to avoid data loss, modify permissions and database structure, install upgrades and patches, and merge old and new databases. Also called information technology project managers, these professionals plan, oversee, evaluate, and implement computer systems to achieve organizational goals. They supervise teams, develop strategic plans and product maps, troubleshoot databases, and ensure that all applications run smoothly. Employers typically require advanced degrees for professionals in computer systems management roles. Blending business and information technology skills, computer systems analysts research, design, and implement IT infrastructure and system requirements. They define and analyze data processing issues, evaluate processes and procedures, test solutions to increase efficiency, and make recommendations for improvement. They also consult with clients to establish specifications, train personnel, write documentation, and evaluate workflow. Information security analysts protect organizations' data from cyber attacks through planning and implementation of security measures to protect data, systems, and networks. They perform risk assessments, test data processing systems, install firewalls and data encryption software, document security breaches, and create disaster recovery plans. They also research and recommend security enhancements. Network and computer systems administrators maintain efficient, secure, and reliable operation of data communication networks. They install, configure, monitor, integrate, and support server hardware and applications. They also perform routine maintenance, ensure network connectivity, set up user accounts and permissions, watch for updates, and test for network security weaknesses. The first step towards access to federal financial aid for your master's in database management is to complete the FAFSA form. You may also qualify for scholarships and loans through private sources based on your specific career interests, particularly in high demand areas such as big data analytics. Oracle, Xerox, and other large companies often offer scholarships for minority students. Organizations specializing in operations research, information assurance, and healthcare information systems also commonly offer scholarships for database management students.